Halloween is the best holiday. It's scary and fun rolled into one day. 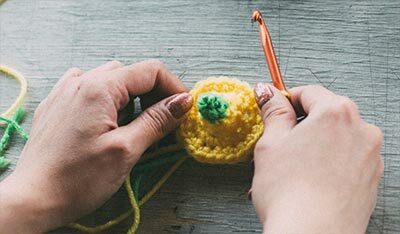 Here are three easy pompom projects, which are great for party decorations or for decorating your "Trick or Treat" bag. 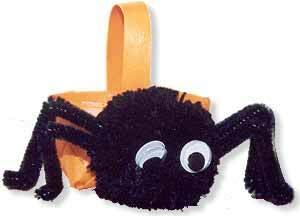 Our creepy, crawly spider is made with a pompom base, the starting off point for lots of fun yarn projects. To make pompom for spider body, wrap yarn around 2" width of cardboard 75 times. Cut an 18" length of yarn, fold it in half and lay it down on your work surface. Slip yarn off cardboard and place over piece of yarn. Tie yarn tightly around center of yarn bundle, which you have removed from the cardboard. Cut yarn loops open and trim excess yarn to create a round body. Cut six 3" pieces from the black chenille stems. Bend each one in half, then bend one end up to ½" for foot. Glue legs to sides of pompom, 3 to each side, and wiggle eyes to front. Here's one pumpkin that doesn't need carving! 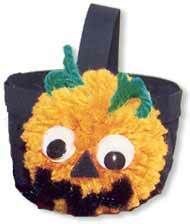 To make pompom for the pumpkin, wrap orange yarn around 2" width of cardboard 75 times. Cut an 18" length of green yarn, fold it in half and lay it down on your work surface. Slip yarn off cardboard and place over piece of yarn. Tie yarn tightly around center of yarn bundle, which you have removed from the cardboard. 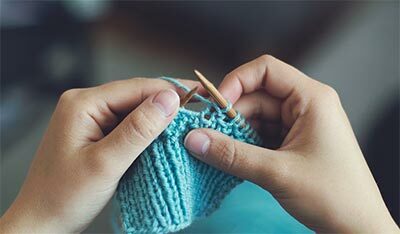 Cut yarn loops open and trim excess yarn to create a round body. Cut nose from black craft foam or felt. Cut a 2" piece of black chenille stem, bending it several times for the mouth. Glue wiggles eyes, nose and mouth to front of pumpkin. Trim green yarn so it is the length of a stem at top of the pumpkin. 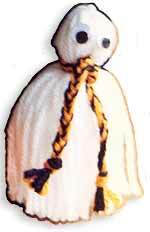 Our friendly ghost starts with a tassel base and is embellished with a braided tie and wiggle eyes. cardboard cut to 4" by 3"
Body of ghost is a tassel. Wrap white yarn around 4" length of cardboard 50 times. Cut an 18" length of yarn, fold it in half and slip it under yarn at top end. Tie strands tightly together at top. Clip other end open. Wrap a braid (see step 2) tightly around strands and knot about 3/4" below top knot. Trim ends of tassel evenly. Cut 3 black and 3 orange pieces of yarn each 12" in length. Knot the ends together on one side. Braid (3 groups of two strands each, one strand of each color.) When braiding is complete, knot other end. Trim end evenly. Glue wiggle eyes in place at top of braid.